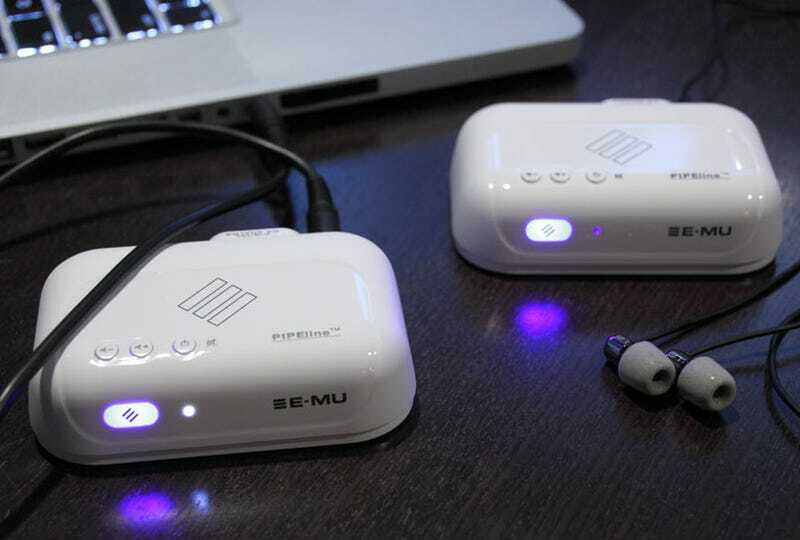 The Gear: E-Mu's Pipeline low-latency wireless music system, which lets you cut the cord on your guitar-and-amp rig for about $200, or add portable wireless connections to your home sound system. The Verdict: It's a unique set of wireless toys that is a lot of fun to play with, and would have been a must-have back when I used to play guitar in a band. But these things can be cool even in the home of a total non-musician, which is why I'm bringing them up at all. Think of it as Sonos Portable. You set one of them to transmit, and start playing a song from your computer, iPod, any audio source at all really, including, mind you, a CD or DVD player with S/PDIF output. Set another one to receive, then attach that to earphones, a boom box or your home theater system, and you hear everything with no latency. Well, with about 10 milliseconds of almost totally unnoticeable latency. In "broadcast" mode, you an add additional Pipelines—E-Mu says "any number of receivers"—so that many rooms, or many people, can catch your tuneage at the same time. Of course, if you do play music, you can plug your guitar into one, set it for "pairing" mode, stick another one at your amp set to receive. In this scenario the latency is just 6.6ms, and you are suddenly completely unfettered. I tested it in my house using prerecorded audio, and it sounded great. I stuck my computer with the source music down in the basement, and clipped a receiver to my belt with headphones plugged in, and wandered throughout the house. The signal faltered only when I was at the absolute farthest point away from the source, which probably was right around the advertised 15 meters (49 feet) of range that these babies can get. Battery life is good, perhaps the big reason this thing even brushes the $100 point: You get 10 hours in receive mode, and 5 while transmitting. The only issue I ran into, if you could call it that, was the "DIP switch" setup, which you can see in the rear shot above. I am not afraid of a few switches, but it seemed a complex way to set the channel, the receive or transmit mode, and the audio preferences. Not sure what would have been better, and once you set them, you can almost forget them, but it was, initially, a bit of a pain. These babies aren't cheap, but setting up a way to wirelessly listen to music at home (like, say, piping music outdoors, syncing music between multiple rooms, or even walking around with earphones, listening to music playing somewhere else) seems worthwhile for $200, and the one-to-many broadcast mode makes it quite a unique product. My only gripe is that it would be cool if E-MU made an even better priced unit without the battery, so you could pick and choose.